Each year there’s an autumn weekend which is anticipated with particular glee: the one in which the clocks go back. The prospect of an extra hour in bed is certainly enticing, and the Sunday has duly been labelled “National Sleep In Day”. But the fact that sleeping in is designated to this one particular day betrays something else – that idleness is seen as wasteful, self-indulgent. A lie-in is only encouraged when time itself moves to accommodate it. For some perspective on how the idea of laziness has changed over time, we could do a lot worse than consider the natural world’s undisputed champion of indolence – the sloth. Because the one thing everyone knows about sloths is that they are slothful. The clue’s in the name. But it’s a name with a long and curious history. Sloth entered the English language in the early 12th century as a term for mental and physical sluggishness. It wasn’t until the early 17th century that the word was applied by European explorers to tree-dwelling mammals in central and south America. Sloth, in other words, was the name of a human quality long before it was the name of a distinct species of animal. And sloth is not any old human quality; it is – along with envy, gluttony, greed, lust, pride and wrath – one of the seven deadly sins, a catalogue of depravity that has been circulating in one version or another since early Christian times. 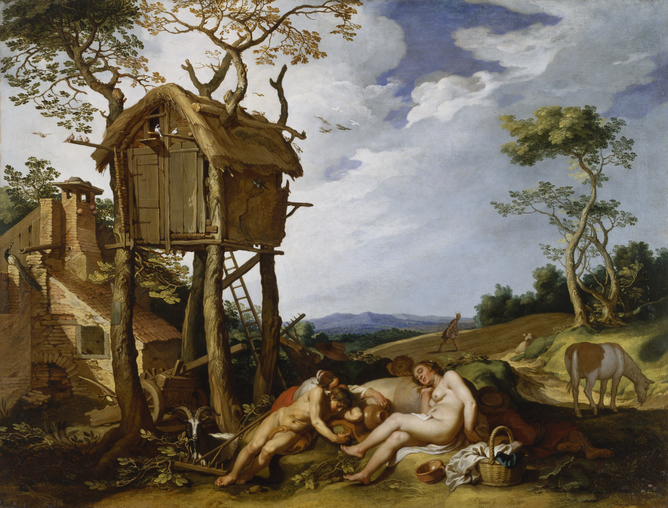 Abraham Bloemaert, Parable of the Wheat and the Tares, 1624. The devil sows weeds in the field while lazy peasants sleep. Definitions of the sin of laziness have changed notably over the centuries. What we now call sloth was originally understood as an occupational hazard for the early Christians known as the Desert Fathers, the hermits and monks whose punishing regimes of piety, prayer and self-denial exposed them to the temptations of de-motivation and listlessness and a sorrowfully distracted state of torpor known as acedia. In the medieval period, as sloth superseded acedia in the religious vocabulary of the time, the concept broadened to encompass all forms of sinful inactivity and workshy idleness, from neglecting everyday chores to falling asleep in church. The particular danger of sloth, in the medieval imagination, was as a gateway sin. Anyone who is prone to idleness is, by definition, going to lack the energy to resist the temptations not just of sloth but of all the other sins. For this reason, popular tales of people who were victims of their own laziness – too lazy to move as mice nibble away at their ears, too lazy to cut the noose from which they are about to be hanged – had significant currency in the medieval imagination. It’s fair to say that the seven deadly sins don’t have quite the grip on the imagination that they once did. Images of sloth in the modern world have precious little to do with its origins in early Christian theology. For example, in recent years major UK furniture retailer Sofaworks has run a high-profile advertising campaign starring Neal the Sloth, who is every bit at home lounging on this firm’s various chairs and sofas as his fellow sloths are in their natural rainforest habitat. A spin-off website, which sells Neal merchandise, excitedly announces that owing to the success of the sloth campaign the world has gone “sloth mad”. The arrival this summer of London Zoo’s latest baby sloth, Edward, would support this: he was greeted with widespread press coverage and thousands of YouTube viewings of the tiny nocturnal mammal clinging to a sloth-teddy from the Zoo’s gift shop. What, we may ask, would a time-travelling visitor from the medieval period make of our fondness for sloths? They would probably be slightly perturbed to find a deadly sin as the stuff of soft furnishings and cuddly toys. We could reassure our sceptical visitor that it’s possible to learn a thing or two from sloths. They live a low energy lifestyle; they are generally peaceable; and they understand the virtues of taking your time. Any animal that takes two weeks to digest a meal could certainly teach us a valuable lesson in the virtues of mindfulness and contemplative patience. The sloth is the perfect mascot for a culture that is looking to cure itself of addiction to a hyperactive 24/7 work ethic. Now that we have rehabilitated sloths as the slacktivists of the animal kingdom, perhaps the time has come to formulate a laziness ethic as an alternative to the work ethic that has dominated our society for so long. But a closer look at sloth merchandise reveals that work and laziness aren’t always quite so easy to separate. Take Rob Dircks’s humorous self-help book, Unleash The Sloth!. The book promises to provide “75 ways to reach your maximum potential by doing less”. Who wouldn’t want to unleash their sloth? But do we really have to do so in 75 different ways? Unleashing the sloth is beginning to sound like hard work. Which is to say that even a tongue-in-cheek book, which is all about cutting corners and streamlining your life, is still part and parcel of the busybody culture of personal growth, self-improvement and enhanced productivity. Even the most unapologetic attempt to champion inactivity – call it sloth, laziness, idleness, rest – does so in the name of activity and productivity. Laziness has a job to do – whether it’s selling sofas, cuddly toys or books. And so sloth, despite our affection for the creature of that name, retains its place as one of the deadly sins of the 21st century. I hope you enjoy that lie-in.